Located in the heart of Beverly Hills Dr. Joubin Gabbay, M.D. is a Board Certified Plastic and Reconstructive Surgeon who specializes in the art of aesthetic plastic surgery. Dr. Gabbay's innovative techniques, technology, expertise, and natural results ensure you will look and feel your very best! 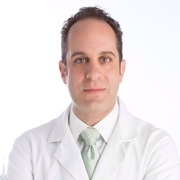 Dr. Joubin Gabbay received his training in general surgery at the renowned Cedars-Sinai Medical Center. During his training, Dr. Gabbay conducted cutting edge research as the Bernard J. Sarnat Research Fellow in UCLA's Division of Plastic Surgery. His work resulted in the publication of over thirty scientific articles and invitations to present his work throughout the world. He then completed his training in UCLA's preeminent Plastic Surgery program where he worked with international leaders in cosmetic and reconstructive surgery. Dr. Gabbay then underwent additional training at the Rancho Los Amigos National Rehabilitation Center in Plastic Surgery. He has emerged as a leader at the forefront of cosmetic surgery and is a respected member of the staff at the Cedars-Sinai Medical Center. Sólo tienes que subir tres fotos estándar ahora para ver una simulación 3D en tu próxima cita con Dr Joubin Gabbay. Visualiza tu cuerpo o rostro actual en 3D antes de la consulta y obtén acceso desde casa a tu nueva imagen después de la consulta para poder compartirla con amigos y tomar una mejor decisión. Después de la consulta, Dr Joubin Gabbay puede darte acceso para ver tu "nuevo yo" desde casa, con tu propia cuenta Crisalix. Esto te permitirá compartirlo con tu familia y amigos o con cualquier persona a la que quieras pedir opinión.